Sponges are an important source of secondary metabolites showing a great diversity of structures and biological activities. Secondary metabolites can display specificity on different taxonomic levels, from species to phylum, which can make them good taxonomic biomarkers. However, the knowledge available on the metabolome of non-model organisms is often poor. In this study, we demonstrate that sponge chemical diversity may be useful for fundamental issues in systematics or evolutionary biology, by using metabolic fingerprints as indicators of metabolomic diversity in order to assess interspecific relationships. The sponge clade Homoscleromorpha is particularly challenging because its chemistry has been little studied and its phylogeny is still debated. Identification at species level is often troublesome, especially for the highly diversified Oscarella genus which lacks the fundamental characters of sponge taxonomy. 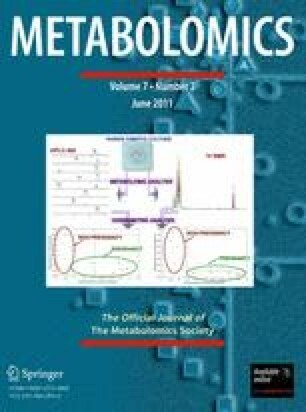 An HPLC–DAD–ELSD–MS metabolic fingerprinting approach was developed and applied to 10 Mediterranean Homoscleromorpha species as a rapid assessment of their chemical diversity. A first validation of our approach was to measure intraspecific variability, which was found significantly lower than interspecific variability obtained between two Oscarella sister-species. Interspecific relationships among Homoscleromorpha species were then inferred from the alignment of their metabolic fingerprints. The resulting classification is congruent with phylogenetic trees obtained for a DNA marker (mitochondrial COI) and demonstrates the existence of two distinct groups within Homoscleromorpha. Metabolic fingerprinting proves a useful complementary tool in sponge systematics. Our case study calls for a revision of Homoscleromorpha with further phylogenetic studies and identification of additional chemical synapomorphic characters. We sincerely thank to N. Penez and G. Culioli (Université du Sud Toulon-Var, France) for their assistance in HPLC–MS analyses and Daria Tokina (Zoological Institute of RAS, St. Petersburg, Russia) for technical assistance. We gratefully acknowledge the scientific help of J. Vacelet, N. Boury-Esnault, C. Borchiellini, A. Ereskovsky, (Centre d’Océanologie de Marseille, France), B. Banaigs (Université de Perpignan Via Domitia, France), M. Mehiri and D. Cabrol-Bass (Université de Nice Sophia Antipolis, France). We are also grateful to R. Graille and B. DeLigondes for diving and sampling assistance. This work was funded by the ECIMAR program (ANR-06-BDIV-001) of the French National Agency for Research.